Ficus is a large genus that includes over 100 species and is a member of the fig family (ficus carica). Some ficus are merely vines and shrubs while others grow into enormous Banyan trees. The more common ficus (ficus benjamina) grows best in warmer climates as listed by the U.S. Department of Agriculture hardiness zones 10B through 11. Ficus roots can be quite problematic. The tree is known for vine-like surface roots that can smother neighboring plants and crack through concrete sidewalks and building slabs, as well as deeper roots that invade plumbing pipes and septic tanks. Removing ficus tree roots is a multiple-step process. Ficus root removal is more likely to be successful if the roots are killed first. Use the chain saw to cut the stump as close to the ground as possible. Make a couple of vertical cuts in the stump as well to aid in clearing out as much debris as possible. Make multiple cuts into the bark around the top perimeter of the tree stump with the ax. Using a disposable paint brush, apply a diluted solution of 25 percent glyphosate, an herbicide found in commercial products, paying particular attention to the bark, where the tree's vascular system is located. The vascular system will transport the poison into the tree's roots. Cover the stump with plastic to ensure that the glyphosphate doesn't rinse off in the rain. Repeat the process seven days later. 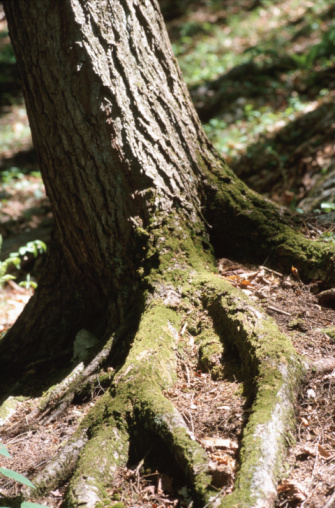 It may take 14 days or longer to kill the stump and roots before they are ready for the removal process. Check to see if the roots are ready to remove by scraping the surface with a knife. If the growth underneath is brown, the roots are dead and ready for removal. If the wood is still green, another application of glyphosate may be necessary. Begin chopping up the larger roots. Use the crowbar to dig up deeper roots. Dig around the roots with the shovel to expose more of the root system. 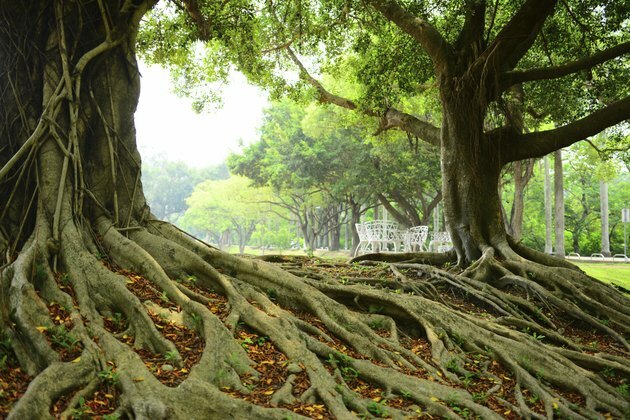 Ficus roots penetrate deep into the soil, so removing one layer at a time is expected.